Here is pretty much all you need to know about Queenstown, New Zealand. I wanted to buy a bicycling jersey for my husband, Larry, in Queenstown, during my trip there in November to run the Queenstown Marathon. I stopped off at the Tourist Bureau to ask where a bike shop was. The man behind the desk at the Tourist Bureau asked me to step outside onto the street. "See that store across the street?" he asked, pointing to a store. "That's a local bicycle shop." I nodded. "And across the street from that store?" he continued. "There's another bike store there." "Great!" I said. "I'll have my choice of stores." Now he nodded. And continued talking. "And the next street over? There's another bike shop there," he said while pointing up the street. "Wow," I said. "I'll really have my choice -"
The Tourist Bureau guy interrupted me. "And just over a block away, down the street from that bike shop, there's another one..."
I couldn't even come up with a superlative to that response. Four bike shops within a few hundred feet? Or meters, or whatever they call it in New Zealand. What an outdoorsy, Cindy Bishop kind of town! Queenstown, New Zealand is called the Adventure Capital of the World. And for good reason. In addition to bicycling, it seems everyone is this town is either biking, running, hiking, swimming, participating in team sports or high adventure sports such as sky diving or bungee jumping, or, as they spell it, bungy jumping. And the New Zealanders have a right to spell bungy jumping the way they want, since they invented the sport. Queenstown is such an adventurous kind of town that I almost felt... embarrassed... that I came to town to only run a marathon. And that feeling was validated once I went to the welcome party at the Heritage Queenstown Hotel with our tour group, Marathon Tours and Travel. It seemed that almost everyone I met at the welcome party was not only running a marathon but also: bungy jumping, skydiving, or riding the world's largest swing (sort of a combo of a swing and a bungy jump). My group of women from Marathon Tours consisted of Sheri, Abi, and Beata, and me. Beata was already signed up for the world's largest swing experience. Abi was fresh from running Florida's combo of a sky dive, and then, after which the diver hits the ground running... literally... a marathon. Abi was also just a few months away from running a marathon at base camp on Mount Everest. Given those two ultra adventures, she decided to take it easy this trip and only run a marathon and then the next day, hike up and down a mountain for a total of 12 miles. That hike was a trip Abi had also signed Sheri, Beata, and me up for! So when everyone asked me what else I was doing in Queenstown besides run 26.2 miles, I just smiled and said, "Well, we are all going hiking the day after the marathon, then Sheri signed me up for a bicycle ride two days after the marathon." The others would just smile at my response, most definitely thinking: how lame. But, at the end of the weekend, it turns out that we all had the adventure of our life! 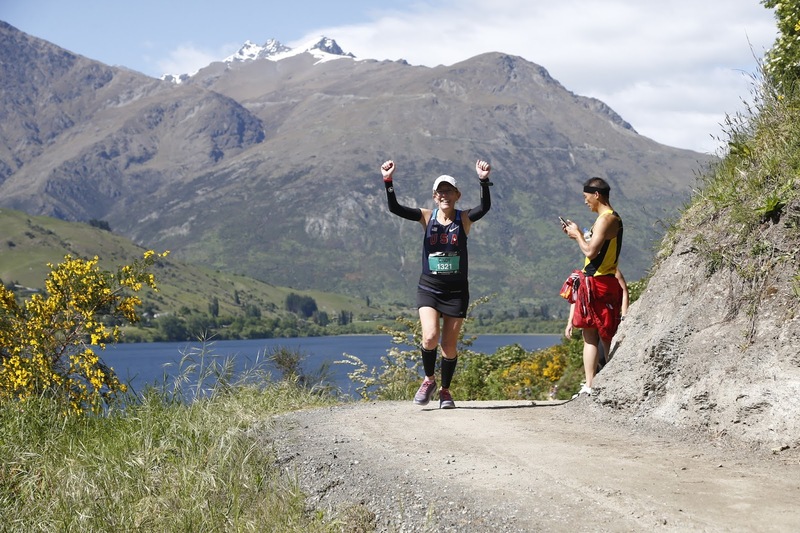 Jacqui, the Marathon Tours and Travel representative in New Zealand, told us all we needed to know about what to expect not only during the marathon but what our options were in the adventure land that is Queenstown. I met Jacqui back in April 2012 when I ran the London Marathon with Marathon Tours and Travel. Look "excellent guide" up in the dictionary and you will see Jacqui's picture. She handled not only the typical tour guide's job of telling us what to do in Queenstown, but also handled, with aplomb, the atypical problems that will pop up on these trips, such as lost luggage and acute sickness that requires immediate medical care. From Jacqui we found out our options as well as info on the race and how to get to and from the town. I don't think I ever saw her without her notebook, which contained information about all of us. I tried to peek at my info but was not successful at seeing "only going on a hike and a bicycle ride after the marathon". We shopped til we dropped the day before the marathon. New Zealand is known for sheep (I ate lamb 3 times during my visit!) and honey (I bought honey soap) and all things... possum (I just couldn't bring myself to buy any possum related clothing...) We also visited the marathon expo, and loaded up on running gear from New Zealand. The night before the marathon, Jacqui arranged a pasta dinner for all of us, about 30 runners from all over the U.S. I met runners at the pasta party from every state I've lived in, a runner who went to Miami University, and at least 3 runners who admitted to also being lawyers. 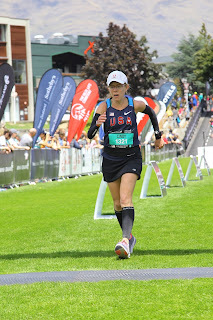 It's also fun at Marathon Tours and Travel parties to meet people with whom I have a lot of things in common, including the crazy habit of enjoying running 26.2 miles through city streets. But... city streets... that's one way the Queenstown Marathon was different from all the other marathons that I've run. 70 percent of this marathon was run on trails in the woods. And up and down hills. To this Florida girl, those hills, some of which were on mountains, felt like I was running up and down Mount Everest. I'll have to check with Abi on that one after she runs Everest next year. But even this very hilly trail marathon was so spectacularly beautiful that all was forgiven, even those steep up and down hills. And the beauty of the marathon was matched by the friendliness of everyone associated with the marathon, from the announcer at the start, who had us all laughing with his pre marathon jokes, to the spectators who cheered for us, to the over 400 volunteers on the course. 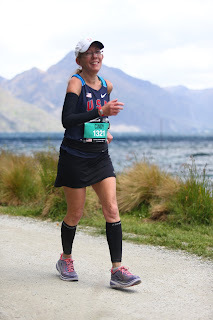 This was only the third running of the Queenstown Marathon, but it was as flawless as any marathon I have run. From start to finish, there were no problems, just beauty and a clean, well marked course. After we all finished, it was time for Sheri, Abi, Beata and me to celebrate. First we rode a gondola up to a restaurant that looked over the entire city. The food was as great as the view! Then, we went to Minus 5 Degrees Ice Bar, where everything was made of ice, except the drinks. It was VERY cold in there, but we kept warm with the coats and gloves we were given and the drinks in the glasses made of ice. The day after the marathon we hiked the Routeburn Track, known as one of the top 50 hikes in the world. This trip lived up to the hype. With a local Queenstown woman named Kana as our guide, we hiked up the Track (essentially up a mountain) 6 miles, then 6 miles down. Along the way we met hikers from the US and New Zealand, and learned all about the flora and fauna of the Track. We were lucky to get Kana as our guide. Kana knew every part of the Track like the back of her hand. Not only did we learn about the Track but Kana answered every question I had about New Zealand - especially the emphasis on the outdoors and sports that the local schools give to all students. By the end of the hike, Kana became not only an excellent guide, but a trusted friend. She made this mountain day long hike seem like just a walk in the park. Kana led us up to the apex of our tour, the Routeburn Falls. Thanks, Kana for a walk of a lifetime! The next day we said goodbye to Abi and Beata, who headed back to the US, and Sheri and I went on our bicycle ride. Sheri and I got on a bus in downtown Queensland and headed off for our ride on a trail to a winery. There were about a dozen other people on the ride, all of whom I expected to befriend on the ride, including whoever was our guide. I missed Kana, but today I was ready to replace her with our bicycling guide, who I was sure would be my new best friend forever. 1. Kana was not there. 2. There was no new Kana. We had no guide. 3. None of the other people on the bus were going to be on our trip. They were all on a wine trip, visiting numerous wineries, where they would eventually end up at our winery. 4. If I didn't figure out #3 initially, I could have looked at the back of the bus on the outside bike rack and realized that there were. only. two. bikes. 5. On the hike, Kana gave us all laminated, multi colored and multi paged illustrated maps. We were not given a map on this ride. 6. Sheri and I were the only ones on the bike ride. After breakfast at a local pastry shop, where we were left off the bus with our bikes, and after quizzing the locals about how to get to our destination, Gibson Winery, (just follow the trail, we were told. And ride down river!) we bravely set off on our own. At first, it was a dream ride. We found the trail (of course we did, we quizzed about a dozen locals) and followed it down river. We felt like Huckleberry Finn and Tom Sawyer, but without the raft. We immediately found the place where gold was first discovered in New Zealand (X marks the spot!) in 1862. We cycled past amazing scenery. We rode over swaying bridges. What an adventure, we thought. Then the trail ended. The highway appeared. Lots of trucks, campers, scary cars. Sheri and I looked at each other, both of us silently hating the other for being on this trip. "Uh, which way do we go now?" I asked Sheri. "Well, I could check the map" she answered, "but..."
We both laughed. What else could we do? We were at a three way intersection, with no idea which way to go. 1. We were lost in New Zealand and there was no one to help us. 2. Kana was not there, and neither was her replacement bicycle guide. 3. The scary vehicles were riding past us very quickly, on the WRONG SIDE OF THE ROAD. 4. There were tons of dead animals - even some rabbits! - all along the road. I was riding in front of Sheri and would call out each animal to her. Sheri did not think that was funny. "We are next to die," I think I heard her call out behind me, but I wasn't sure, the trucks speeding towards me were so loud. I tried to look for dead kangaroos, but aren't they only in Australia? 5. I tried to check my phone for Google Maps on how to get to the Gibson Winery but all I got was a message that "You can't get there from here." When I tried to open up the map, I discovered that Gibson Winery was... in Australia. With the kangaroos. It was a place we couldn't get to on a bicycle since there was a body of water (an ocean?) in the way. 6. My brakes failed about 2/3 into the ride. Every single time we came to a downhill, my favorite part of any ride, I had to walk my bike down the hill, instead of going fast so we could get to the winery. Or to Australia. But then - the ride got better, due only to the AMAZING people of New Zealand. Every time we came upon another hiker or cyclist, we asked them which turn to take. To a person, they were all super friendly - and helpful. Who needed maps when we had the world's greatest people to get us, mile by mile, or kilometer by kilometer, even on the wrong side of the street, to Gibson Winery. Umm... about Gibson Winery. When we finally came to yet another intersection on the scary road ,and there were no amazing and nice New Zealanders to ask directions from, I explained to Sheri about what my Google maps said. "So, Gibson Winery is in Australia," I said, laughing, as if this kind of thing happened to me all the time. Which it kind of does. "Cindy!" Sheri replied. "It's Gibbston Winery! You spelled it wrong!" Well, that was news to me! I quickly typed in "Gibbston Winery" onto my Google Maps on my phone, and low and behold, we were 2 miles - or kilometers, at that point it didn't really matter - away from our destination. We rode quickly to our winery, Gibbston, stopping only when we came to a downhill when I had to walk my brakeless bicycle. Once we got there, I had to struggle to open a steel fence that enclosed the winery, due to, as it said on the sign, the fact that rabbits would chew on the vines so they had to fence them out. Good thing it wasn't the Gibson Winery in Australia where they would also have to fence out the kangaroos! At the winery, the first thing we see is our tour bus, with all the passengers waiting in front of the bus. For us. Our driver pointed to his watch and said "It's 1:59 P.M. We leave to go back to Queenstown in 1 minute." Using my mediator skills, I quickly pointed out that not only were we not given a time that we were supposed to be back at the winery, but the map less ride and the failed brakes on my bicycle caused us to be late for the wine tasting, which we had paid for. The driver said he would give us 5 minutes. Sheri and I went over to the wine tasting room, where the man behind the counter poured both of us 3 glasses of wine, the winery's finest wine. We both looked at each, each thinking, "we went to college, we can do this quickly" and quickly downed each glass, not taking time to swirl the glass, inhale the vapors, and slowly sip the wine, like you see people doing at wineries or in the movies. We ran back to the bus, which the driver had waiting for us, for the ride back to Queenstown. Buzzed from our adventure on the road and 3 quickly "sipped" glasses of wine, Sheri and I realized that we had just had one of the great adventures of our lives, in the adventure capital of the world. In Queenstown, we happened upon a street musician, playing Louis Armstrong's song, "What a Wonderful World". I stopped and listened to the musician's beautiful rendition of this song. I thought of the past few days in Queenstown, everyone I had met, and Sheri,'s Abi's, Beata's and my adventures running the marathon, hiking, and biking. The musician was right. It all had been such a wonderful world.